Is your dog’s bed getting old and worn? Dogs spend more than eight hours on their beds, so it is even more important for them to have a comfortable place to sleep. Maybe your dog is hard on her bed, scratching it shapeless or chewing it into shreds. An elevated bed is a good compromise between comfort and durability. Elevated beds provide comfort and support for your dog’s joints, and won’t get wet or dirty if your dog drinks or eats near them. A water-resistant bed like the K&H Elevated Pet Bed will still be dry and comfortable after light water spills or excessive slobbering. The elevated mesh keeps dogs cool even in hot weather, and helps keep your dog’s skin dry and healthy since there is plenty of airflow through the mesh. Devotedtodog.com is giving away one of these high quality K&H Elevated Pet Bed for free to one lucky winner. If you are the winner, you will receive a 100%-discount code that will allow you to have the bed shipped from Amazon.com® with no charge to you, not even shipping costs! This sturdy bed is tested to 150 pounds and is durable enough for most dogs to abuse for years. 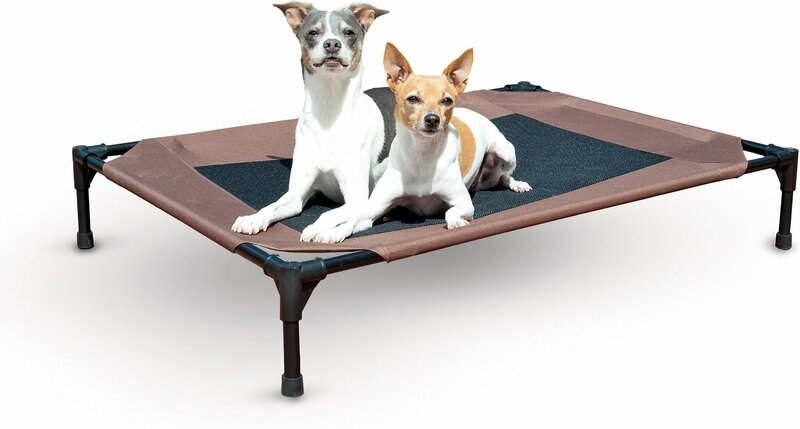 The non-skid feet keep this bed from sliding around, even if your dog is the type to dive into bed. Assembly is simple and tool-free, so you will have your dog lounging in comfort in no time. A one year warranty puts your mind at ease about the quality of this product. Don’t miss your chance to win from September 1 through 10. 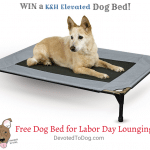 You will have a chance to win the K&H Elevated Pet Bed, a $35 value every time you enter! Good luck! Enter as many times as you want. The more times you enter, the better your chances will be to win. Be a good friend and let your dog-loving buddies on Facebook, Twitter, and Instagram know as well. I am excited for this giveaway for a few reasons really. Most dog beds that are the oversized pillow type get lumpy and uncomfortable for dogs. This looks sleek. Not only does it look sleek but it looks like I could easily take off the fabric part and throw it in the wash much easier than a pillow type bed. its fun giveaway to enter. I’m excited for my fur babies to even have an opportunity to own such a nice bed. I have two pitbulls and I know they’d appreciate it!!! I am excited for this as it would help keep pressure off my digs joints so he can sleep peacefully. My best friend’s dog has been having hip troubles and this would be perfect for her. My lab mix has one bed in his crate. I would love one for the den for him. Very excited to win for my moms sweet Ally we are fixing a mother-in-law suite in our basement and the floors will be a little chilly so Ally would be a happy girl. O’m excited because this bed would be just right for our beagle, whom loves her comfort! I would really like this bed for our boy Bailey. He needs a bed because his bed has been taken over by our cat Jasmine. I’m excited because I have a dog and love giveaways. I would love to win one of these for my dog who has joint issues. Dog beds are too lumpy and are hard for him to get up from. love the washable feature! my mom just got a new dog that would love this! I am sure my pups would love this. Love to spoil them. My biggest dog could really use this. I’m excited because my dogs love climbing up onto a bed, this could be it for them. I’m excited about this contest because I love to win stuff for my animals! ! Gunner would love this bed — looks really comfy and plenty big enough. I’m excited about this giveaway because my Bailey really needs a new bed. Quality dog beds are so expensive and Bailey deserves the best! This bed seems really cool and I think my Bailey would love it! I’m excited because I have 2 fur babies who would love this! I am excited because my pup needs a bed. And this one rocks! My puppy would love this when we go camping. I’m excited because it looks like it would be comfortable for my furkids and I love that it’s elevated. My daschunds would love this Bed! My fur baby Sheba could use a nice bed. Thanks for the chance! I’m excited about this giveaway to have the opportunity to win this for my dog. I am so excited to have won, my doggies will be too. Thank you for your generosity!